People suffering from anxiety disorders are almost twice as likely to abuse drugs and alcohol than their counterparts.1 Teenagers may be especially vulnerable, as the adolescent brain is still developing, making them more likely to give in to impulses and turn to drugs.1 Learn more about the symptoms of co-occurring anxiety and drug abuse in teens, and how to spot them in your own child. There are evidence-based treatment methods for both disorders, and a variety of treatment program settings that offer such therapies. Anxiety is a normal, natural, and useful emotion that everyone experiences from time to time. It can help people recognize signs of danger or threat so that they can take action accordingly and seek safety. A certain amount of anxiety can also be a great motivator. For example, feeling anxious about an upcoming test or sporting event encourages people to study or practice to improve performance. But, when anxiety occurs on a regular basis and even simple daily activities become a perceived threat, it can have detrimental effects on a person’s life. For some teens, chronic or severe anxiety is a daily reality. Normal activities such as attending school, going to work, and engaging in social or extracurricular activities can cause feelings of unease or panic. This anxiety can have many negative consequences, from poor academic performance and social difficulties, to more life-threatening problems such as drug and alcohol use, self-harm, and/or suicide attempts. Major life adjustments: Transitions such as moving, parental divorce, illness, and loss of a loved one can cause situational anxiety in teenagers. Without the appropriate coping skills and emotional support, it can be tough to get through these big life changes. Some teens may develop chronic anxiety in association with life-stressors such as these. Social media: Teens are more connected than ever thanks to social media. A significant part of their lives is spent behind a screen, and there are many ways this can contribute to anxiety. A teen who spends all of their time on social media may have anxiety over real social interactions. So, while in some ways it makes people more connected, in other ways it makes people more disconnected, isolated, and lonely. Social media increases the pressure to be liked, creates a fear of missing out (also referred to as “FOMO”), and makes it easier to compare oneself to others. Bullying: The way teens bully one another has changed. Social media makes it easy for kids to engage in cyberbullying by giving them the freedom to say hurtful things without even seeing the person’s face, sometimes even doing it completely anonymously. Additionally, teens today can’t necessarily leave the bullies behind the school’s doors. Unstable home environment: Children grow up at the mercy of their caregivers with little control of their environment. Teen anxiety is common in situations where there is domestic abuse, substance abuse, and/or poverty at home. While anxiety is quite common in teens, it can be hard to spot, as teens don’t typically express their feelings in the same way an adult would. They’re not likely to just come out and tell you how they feel. Introverted teens may keep to themselves and suffer in silence, while more outgoing teens may act out and be labeled as defiant or oppositional as a result. Having a dual diagnosis of substance use and a mental health disorder like anxiety or depression can be especially challenging for teenagers. They may begin using drugs or alcohol to self-medicate their mental health symptoms, or to try to forget about the factors in their life that are contributing to those symptoms. Some teens may abuse medications that are prescribed to treat a mental health condition. Some medications prescribed to manage acute bouts of anxiety, such as benzodiazepines, can themselves contribute to addiction if they are misused in higher and/or more frequent doses than prescribed. Changes in their group of friends. As part of a dual diagnosis treatment strategy, it is crucial to address both the teen’s anxiety and their substance abuse, as both disorders can feed off one another. Anxiety can lead a teen to relapse and use drugs or, on the other hand, using drugs can cause or worsen existing anxiety. To more effectively treat both disorders, treatment must look at the root cause of anxiety and substance abuse and provide alternative coping skills to help manage anxious feelings and triggers to drug use. Cognitive behavioral therapy (CBT): Cognitive behavioral therapy is perhaps the most widely used treatment method for any mental health condition. CBT helps people recognize the connection between their thoughts and behaviors, identify distorted thinking, learn how to change maladaptive thought patterns, and develop coping skills to avoid problematic behaviors. Adolescent community reinforcement approach (A-CRA): The A-CRA approach helps adolescents replace influences in their lives that contributed to drug-seeking behavior with positive and healthier alternatives. With this treatment, adolescents learn new coping skills by participating in constructive social and recreational activities. Motivational enhancement therapy: This is a therapeutic approach based on the motivational interviewing technique. It works by helping teens resolve any ambivalence about substance abuse and help them find the motivation to participate in treatment. While this treatment can be an effective complementary treatment for adolescent substance abuse, it doesn’t do well as a stand-alone treatment. Contingency management: This approach provides adolescents with reinforcement of positive behaviors to combat substance abuse. Rewards are given for participating in treatment and achieving treatment-related goals. Rewards may include movie tickets, gift certificates, personal items, and more. Teen substance abuse can be treated in either an inpatient or outpatient setting. Inpatient treatment takes place in a residential setting where patients remain at the rehab center 24 hours a day, 7 days a week for a designated period of time ranging from 30 days to up to a year in some cases. Inpatient treatment centers typically provide a combination of individual and family counseling, group therapy, medication (if necessary), and sometimes complementary alternative treatments. Outpatient treatment is a good option for teens that wish to remain engaged in their daily lives and continue to attend school and other activities. Outpatient treatment is usually 6 hours a week or less, and intensive outpatient treatment is up to 20 hours a week and lasts from a few weeks to a year. Patients attend therapy sessions at the treatment facility, but continue to live at home. Both inpatient and outpatient programs utilize similar therapeutic approaches to promote abstinence and help patients work through mental health issues. In addition to the therapy models discussed above, your teen may be encouraged to participate in a 12-step program like Alcoholics Anonymous (AA), group therapy with other treatment patients, and family therapy with parents and close siblings. If you have a teen who is struggling with anxiety and drug abuse, there is plenty you can do to help. First, try your best to get your child into professional treatment for both conditions. Treatment can help your child learn to manage anxiety and develop healthy coping skills as an alternative to using drugs. Encouraging healthy and open communication. Asking about their feelings and share yours. Getting involved in your child’s activities. Being supportive while giving them appropriate space. Working closely with school counselors, teachers, and other adults active in your child’s life. Encouraging your child to channel their feelings into something creative. Recovering from anxiety and drug abuse is difficult at any age and is perhaps even more so for teenagers. If your teen continues to struggle, remember that there is hope. Fortunately, there are a variety of evidence-based treatment strategies for adolescents struggling with anxiety and substance abuse as well as support groups for teens and their families. National Institute on Drug Abuse: Research Report Series. (2010). Comorbidity: Addiction and Other Mental Illnesses. National Institute of Mental Health. (N.D.) Any Anxiety Disorder Among Children. Donner, J., Pirkola, S., Silander, K., et. al. (2008). An Association Analysis of Murine Anxiety Genes in Humans Implicates Novel Candidate Genes for Anxiety Disorders. Biological Psychiatry, 64(8), 672–680. Substance Abuse and Mental Health Services Administration. (2017). 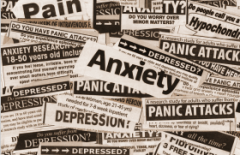 Understanding Anxiety Disorders—Young Adult: Get the Facts. HHS Publication No. (SMA) 16-5010: Rockville, MD. Smith, J. & Book, S. (2008). Anxiety and Substance Use Review. Psychiatric Times, 20(1): 19–23. National Institute on Drug Abuse. (2014). Evidence-Based Approaches to Treating Adolescent Substance Use Disorders.